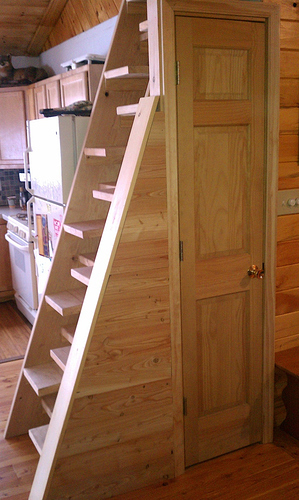 The kids (two) need loft beds for their bedrooms. The bedrooms are small and we need to make the most of the space we have available. I thought it would be a good idea to have a loft bed so the space underneath can be used for storage, or reading, whatever. 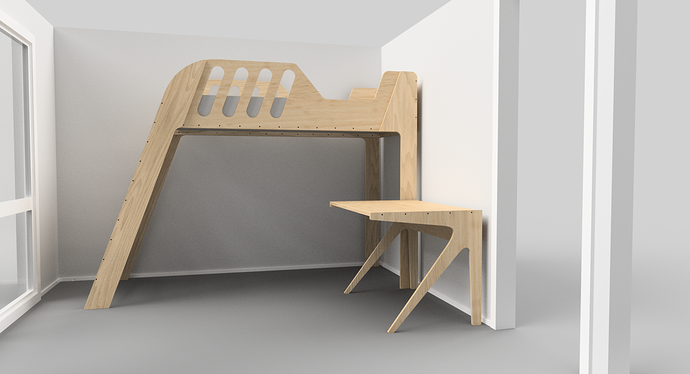 A matching desk would also be a good idea. Matching wood and design means that the whole thing can look light and not take up a lot of 'visual space' in the room. This thing is going to be huge, and the room is small, so the most that can be done to blend things in the better. The loft bed sides are made up of three parts, there is a ladder at the back, where the angled legs are and it's designed to take an Ikea mattress and slats. The desk is fairly flimsy, nobody is going to be standing on it twice, but it will be strong enough for the kids to work on and it has an integrated wire tray at the back to make things even neater. The wire tray makes up a 'C' section for strength. There is a recess on the sides of the desk where the C section slides in to that liberal amounts of glue can be used to supplement the screws. The structure of both pieces is re-inforced with square-drive decking screws which actually look quite nice. They are 65mm long. 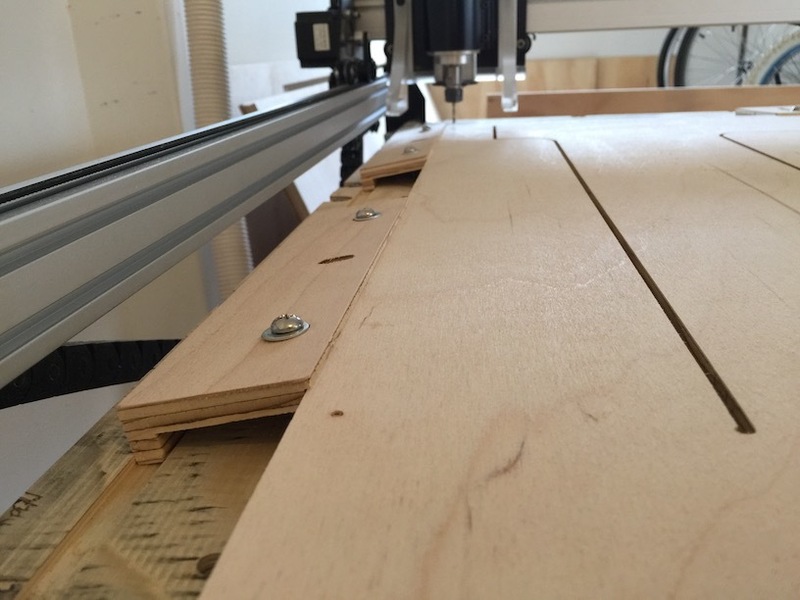 Each sheet of plywood is cut into two strips, one is 800mm and the other 400mm so that they can fit through the x-carve. 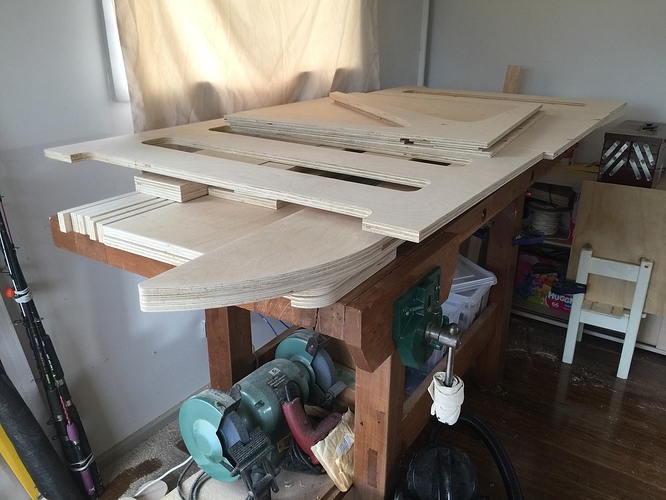 Using my new baseboard and parallel clamps described here https://discuss.inventables.com/t/design-for-a-new-1000mm-baseboard/34201/3 cutting the pieces using three separates operations is possible. 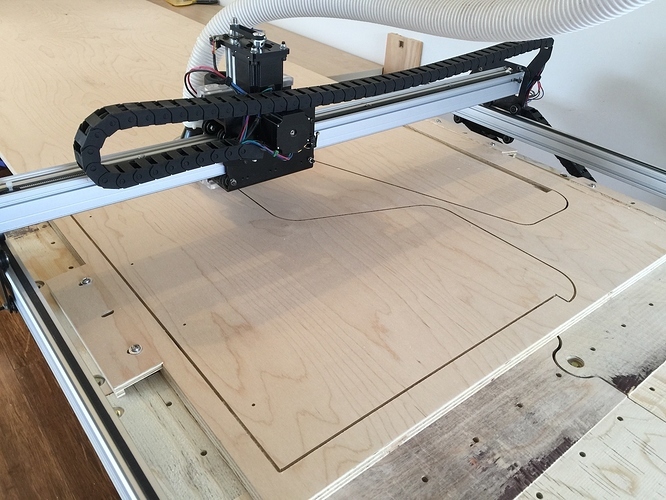 This is definitely my most ambitious x-carve project so far! Awesome! When do you start? 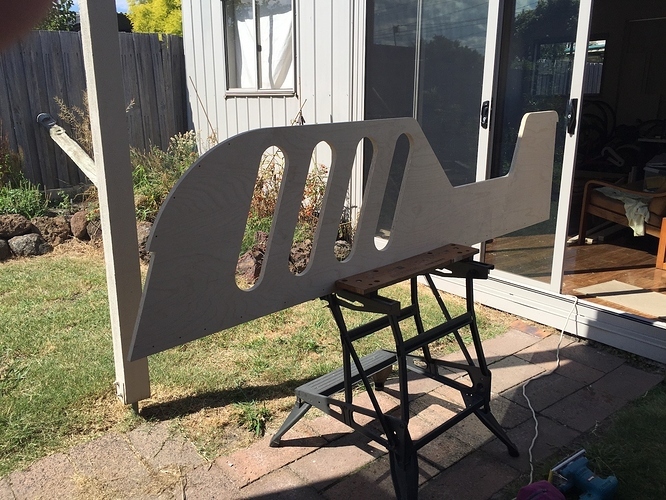 Also like to say great design, but I was wondering by looking would it be possible to add tabs onto the bed sides, where they will fit into the ladder and back support? I would consider adding them if possible for added strength (hook type design) I would be afraid that the kids would be shaking around (like kids tend to do) and loosen the joints. 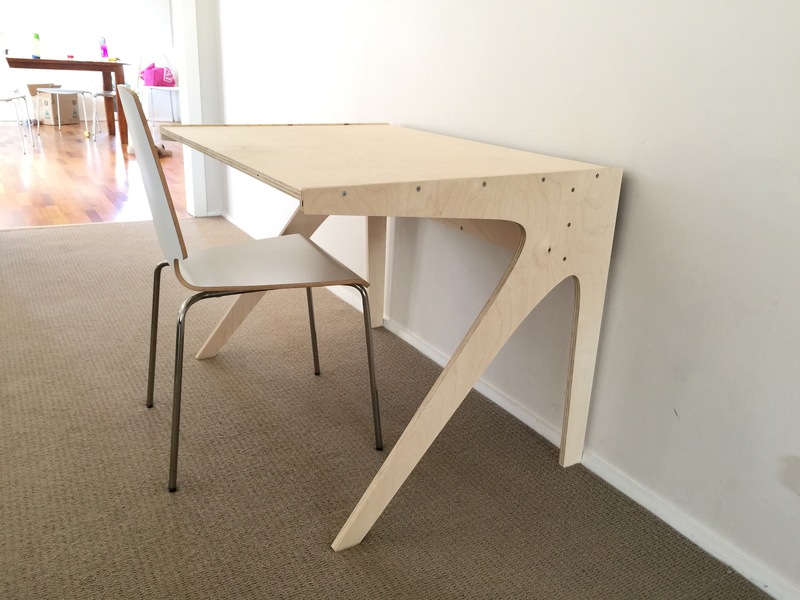 again great design as I always love flat pack style furniture designs. The project is already started, pictures a little later. You're all right about the steps. They will probably be a little too sharp, my plan is to round them with a handheld router if there are complaints. 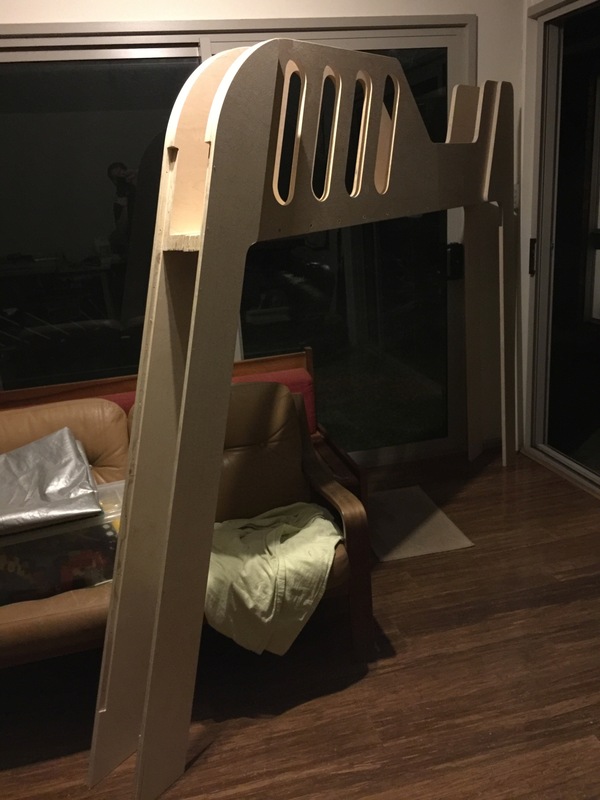 I think there will be enough protection against racking from the angled steps and also, the rails that hold the slats are going to be screwed to the headboard providing extra rigidity there. 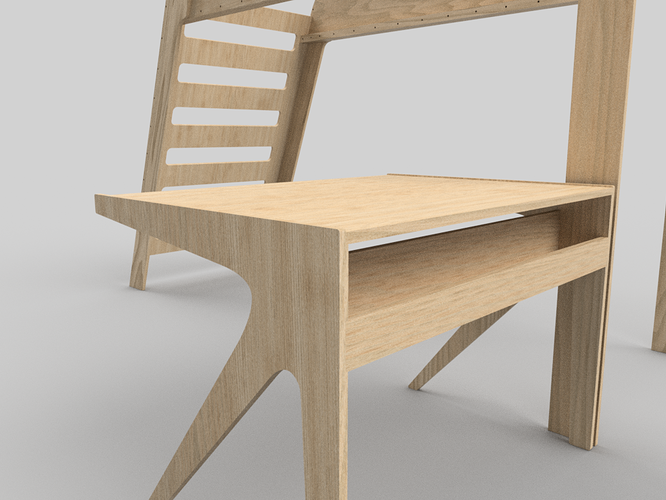 Since those renderings I've also added another piece between the two front legs at desk height. 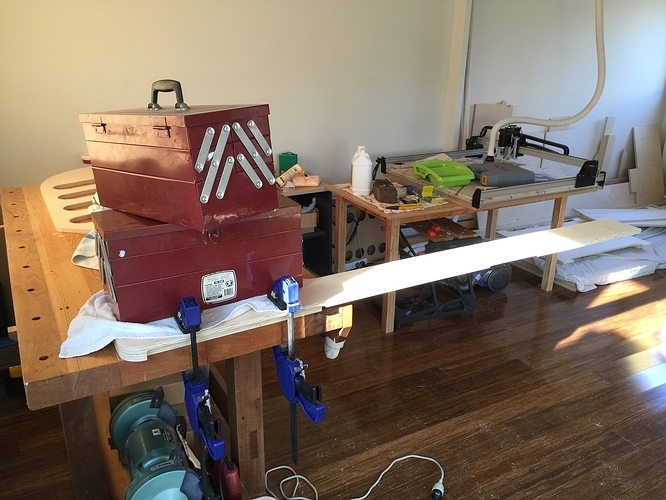 There is support on the way in to the x-carve and once the work started overhanging towards the back I had a similar setup there too. The grey sheet covers the uncut sheets of plywood. 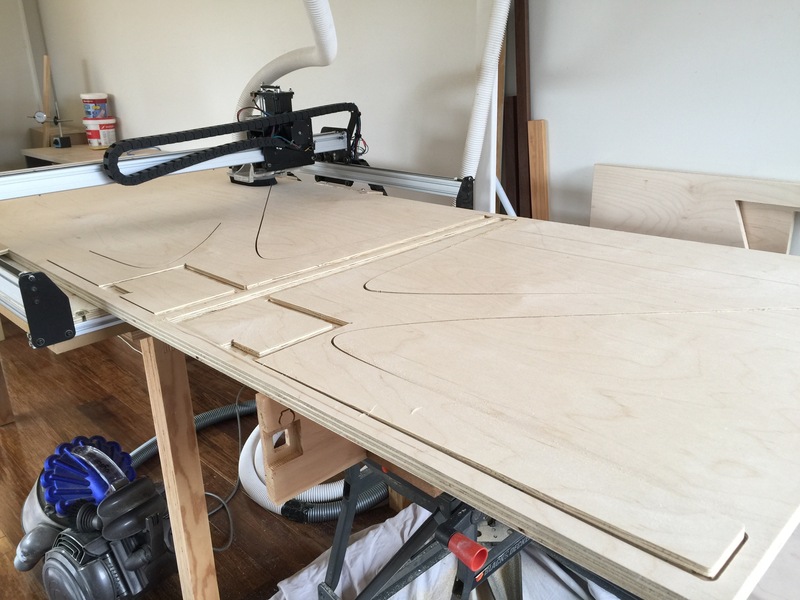 Once a cut was finished I would lift up a new piece onto the back of the x-carve table, then slide it towards the front. 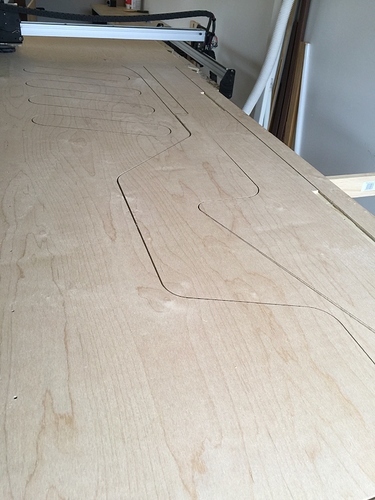 I decided to start with the hardest bits first. Here the machine is cutting one of the sides and a front leg. This is a close up of where two tool paths join after the first cut was finished and the stock was moved back to the next position. You can see that where the cut starts on the left it's not possible to see where the first toolpath ended and the second one began. The little semi-circles of the tool going into the work on the waste side show where the overlap happened. This is a photo of (I think!) 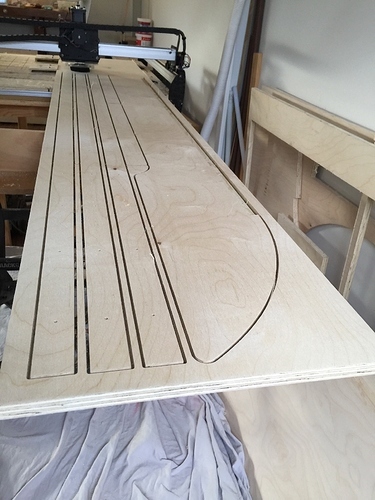 the last cut on the first sheet. 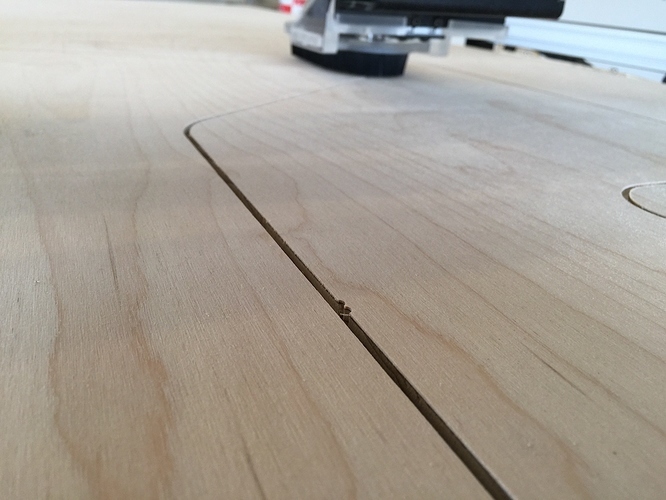 It was really quite strange to see such a large object cut on the x-carve sitting on the living room floor after seeing the exact same shape for weeks inside Fusion 360. What? A hand held router????? LOL, I'm just joking. Seemed funny since 99.999% of your project is all about the CNC router. Sweet man! I feel excited just seeing what you're doing... I'm sure you're super pumped! Yes, I'll have to do something about the steps. Maybe I'll explain to the kids that their feet will hurt but the integrity of the design hasn't been compromised. That's bound to work. I would suggest a "X" structure for under the mattress. With all of the IKEA beds I have had over the years they include a thin metal pieces to act as this but they always strip out and then the slats contort and fall through. What about something like this with alternate half steps. It allows you to go really steep. 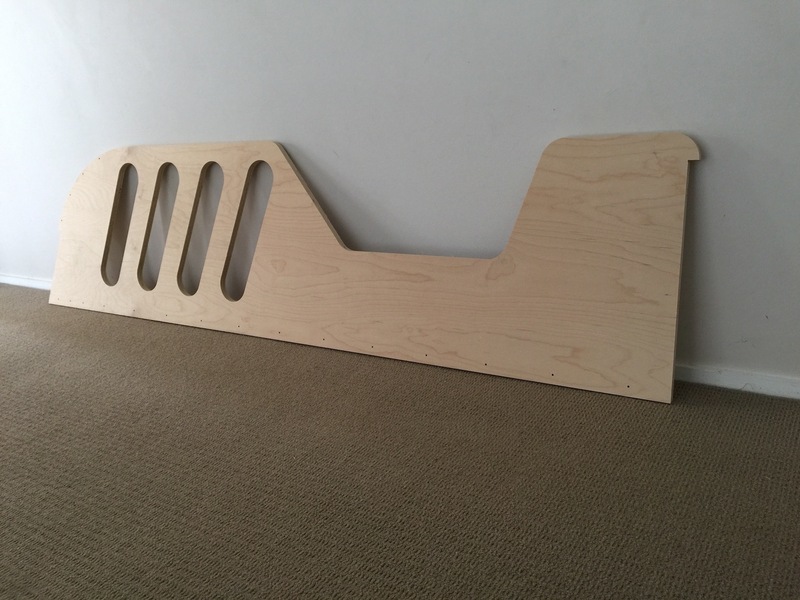 @BlueLocktite I've more or less reproduced the dimensions of his old Ikea bed, but I have made the parts where the slats rest wider. 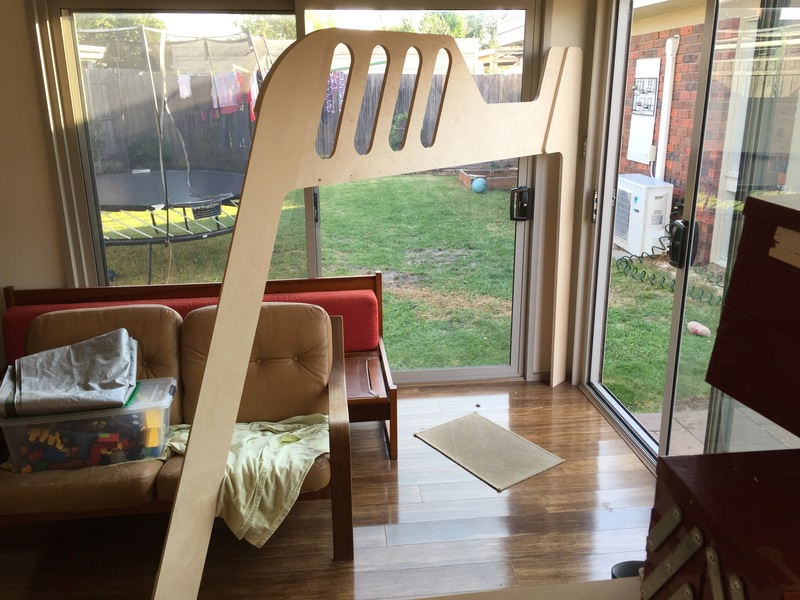 @AndrewGemmell it's a good idea but I really need the steps to go the whole way across for lateral strength. Tonight I thought I would show how I do the indexing. 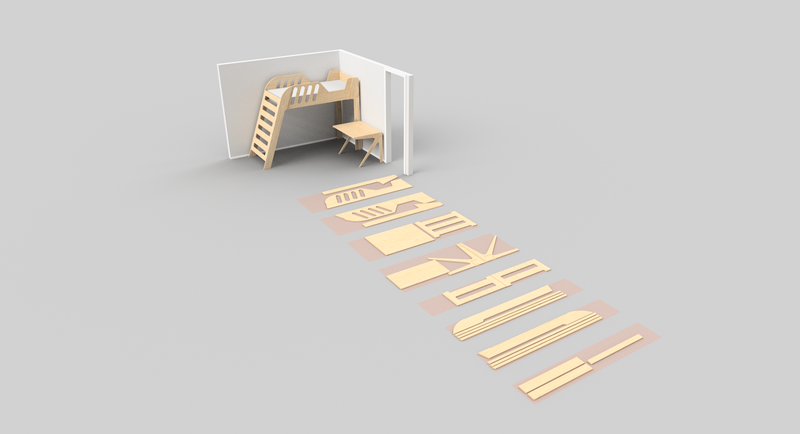 In Fusion 360 I set up four solids which divide each sheet into four work areas. 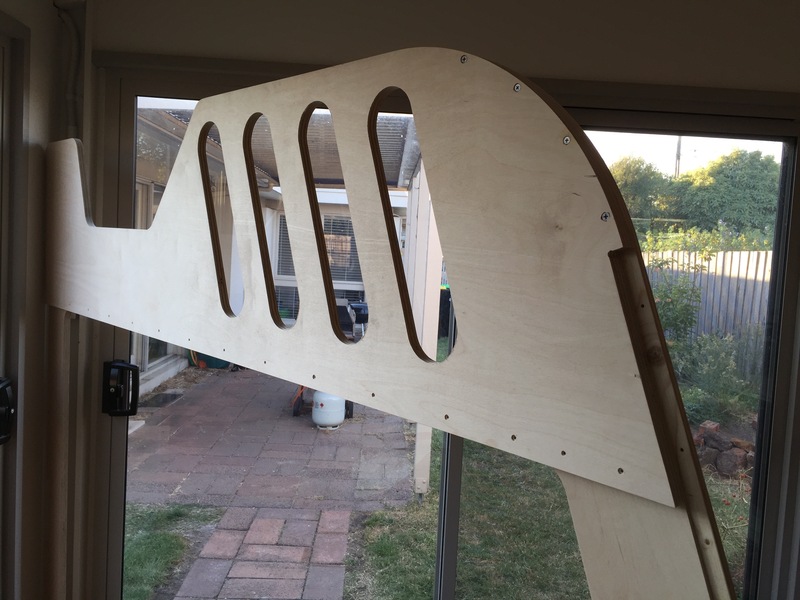 Each solid is 780mm wide and 600 mm deep. Then I set up the cutting operations for the whole sheet BUT THEN, when generating a cutting operation I tell F360 to keep it within one of the work areas. I do that four times per sheet and end up with four cutting operations. The next crucial step is to accurately move the sheet by 600 mm between operations. 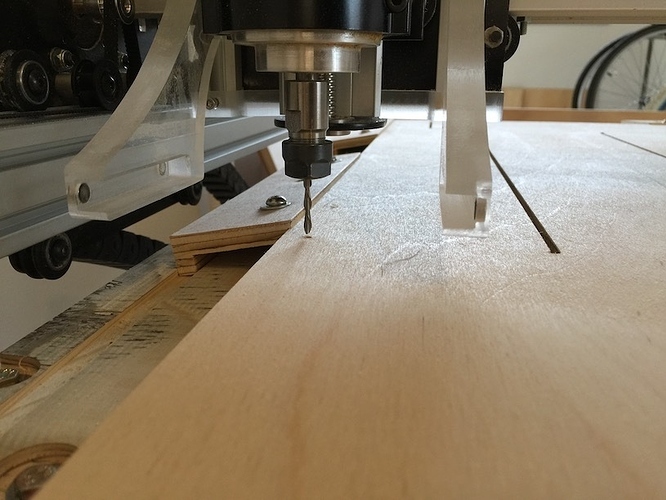 The sheet slides forwards and backwards on the special clamps I mentioned in the first post so it's always in the same position in the x axis, here is how I do the y movement. First thing to keep in mind is that I use the homing position as the zero point, so I don't have to worry about power failures of canceled operation stuffing me up. So when first started the machine homes and I set that position as the zero point. Then I move the tool down to the work surface and set the Z zero. Then I send 's300' and 'm3' to turn on the spindle, quickly jog down to z-1 and then back up to z0. That leaves a little hole at the home position, which is also 0,0. Then I jog y by 600 and now the tool is where the hole I just made needs to be! Then I loosen the screws holding down the ply sheet, slide the ply sheet so that the hole is under the tool bit and then tighten down the screws again ready for the next cutting operation to be started. I like the positioning of your machine. 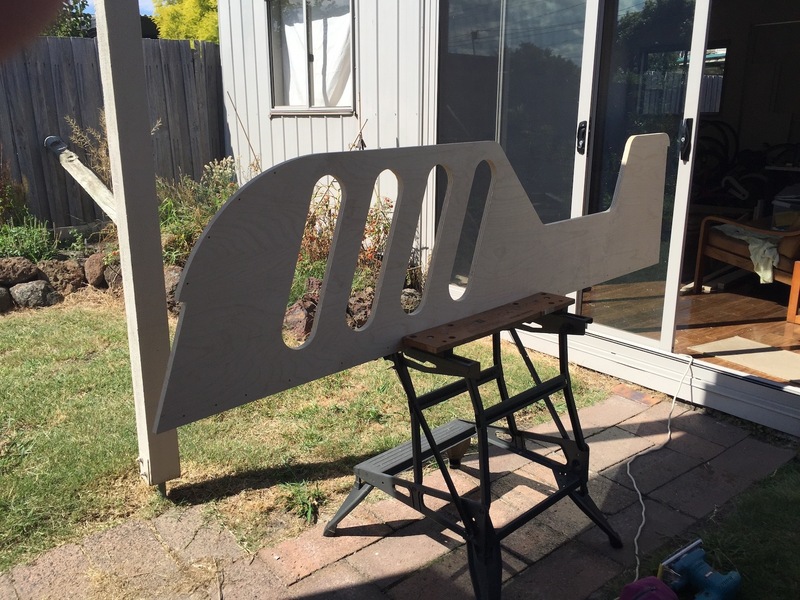 perfect way to make large projects possible. And one of the desk assembled, held together only by friction of the parts and gravity! 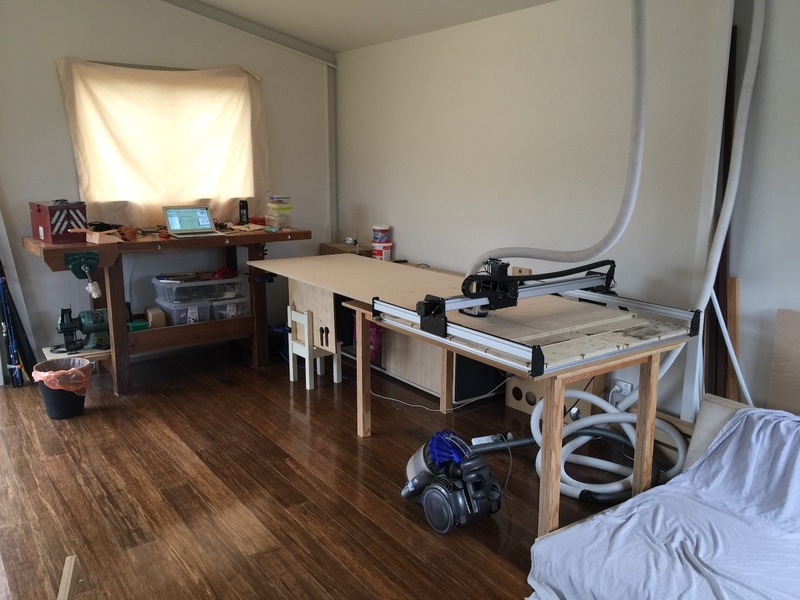 As you can see the room where the x-carve is is a multi-purpose room. My wife and I both work in there but it's the only place I can do my woodworking. I can't have big machines in there or anything that requires a lot of clean up afterwards. The x-carve has been a way for me to do woodworking in a small space. Have a look at the first couple of images. 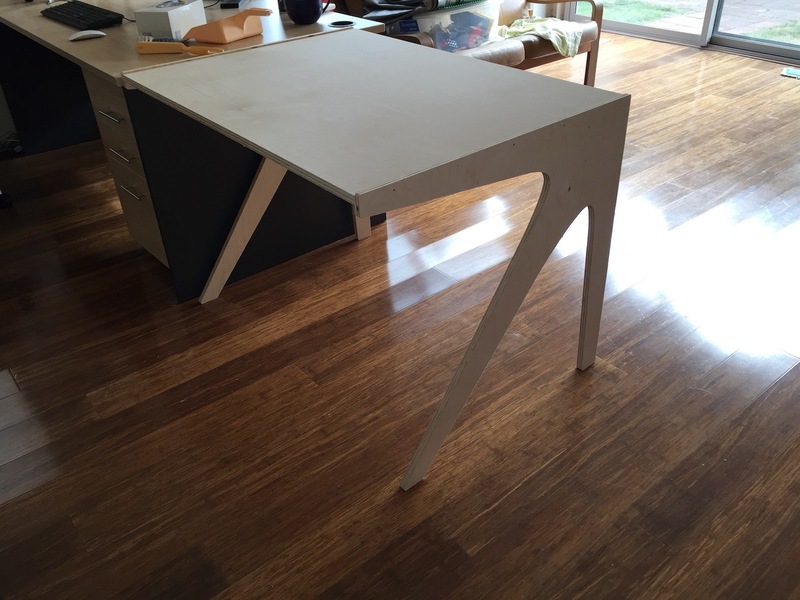 The top of the desk IS between the sides, each side has two legs and a support for the top. The top is slightly recessed into the sides so that the weight won't be borne by the fastenings, the top rests on the sides but the highest part of the top (the top of the top!) is actually below the highest point of the sides to stop things from rolling off the desk. You can click to zoom in on that second picture to see some more detail. Darnit, I just re-read your message and it says 'bed' before legs. Darnit. Yes, the desk can fit between the legs but it won't for the first room it's going to go into. It will be next to it as in the first image at the top. The second suite will go into a slightly smaller room so I'm not sure exactly how we are going to lay it out. Here's what the assembled desk looks like, not varnished yet. hi Emilianomolina ! nice work ! 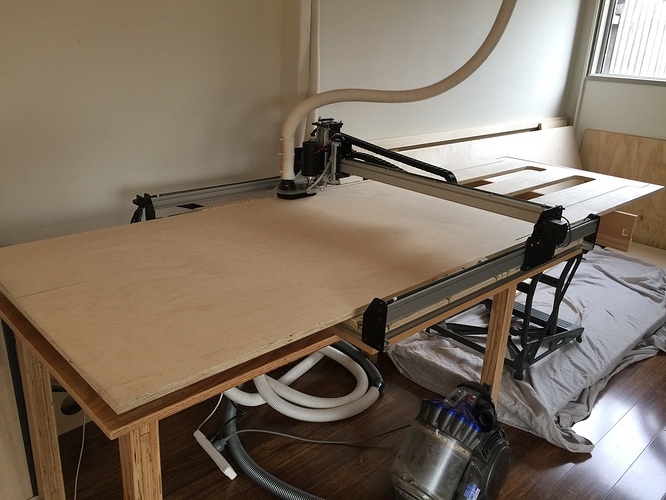 I'm also currently working on flat pack furniture with the xcarve. 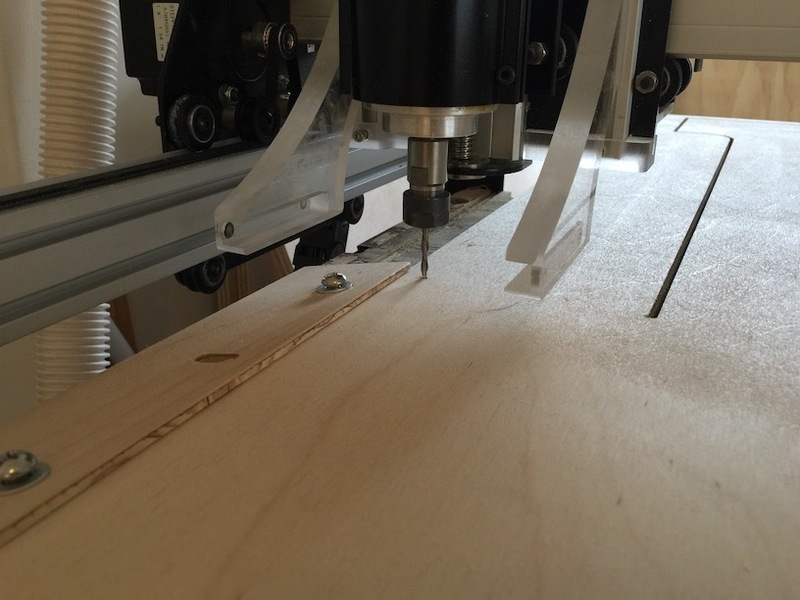 I was wondering about your xcarve specs and the cutting speed, depth of cut per pass and plunge rate. What is the spindle ? Is it a VMC? Thanks for sharing the specs ! Cheers, kev. Hi Kevin, it's a 600mm/m feed rate at a 3mm depth. There is a .4 mm finishing pass at each depth too. The spindle is just a chinese quiet-cut-type spindle. It's a 48V one though, not like the old inventables spindle.